Media captionWho waltzed off with the Strictly glitterball? Former Holby City actor Joe McFadden and his partner Katya Jones have lifted the glitterball trophy and been crowned Strictly Come Dancing champions. The pair beat finalists Alexandra Burke, Gemma Atkinson and Debbie McGee and their partners after each couple had danced three times. The Glaswegian, 42, said he had not expected to win "in a million years". The final was watched by 13.1 million viewers at its peak, with an average audience of 11.6 million. McFadden, who won the public vote, is the oldest champion of the show, which was in its 15th series. "It feels completely surreal and I'm so in awe of everyone who started all of those weeks ago," he said. He called Jones an "amazing woman", adding "thank you for sticking with me and persevering". His partner Jones said: "You did it, you are so brilliant." Reality Check: Did we predict the finalists? 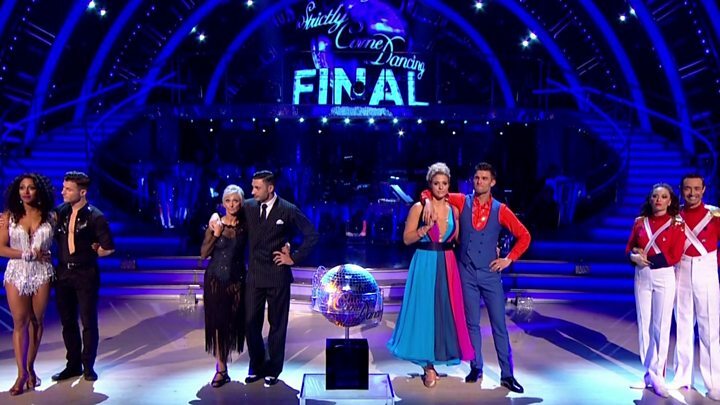 It was a grand final which featured top-scoring dances from three of the four contestants - only Atkinson missed out. McFadden and Jones performed the final dance of the series, a Charleston, and claimed a perfect score of 40. He finished second on the leaderboard, one point behind singer Burke, with McGee and Atkinson third and fourth respectively, but topped the public vote. Following his final dance, head judge Shirley Ballas said: "You've done things I never thought you would be able to do. You have truly turned into a magnificent dancer." Jones was competing in only her second series after finishing sixth last year with former shadow chancellor Ed Balls, who tweeted his congratulations following her victory. He hailed his former partner as a "genius" and described McFadden as "brilliant". Prime Minister Theresa May also tweeted her congratulations to McFadden, along with commiserations to McGee, who lives in her constituency in Maidenhead, Berkshire. The oldest person to have won previously was BBC presenter Chris Hollins in 2009, at the age of 38. There was a 50/50 chance that this year's winner would be the oldest contestant to be crowned in the show's history with 59-year-old McGee, widow of magician Paul Daniels, also in the final. The star-studded final narrowly missed out on matching last year's viewing figures, which peaked at 13.3 million. During the final, each duo performed a showdance - where there were no rules and contestants were allowed to perform any moves they chose. They also revisited the judges' favourite dance of theirs from the series, as well as their own personal favourite, which was only revealed on the night. Former X Factor winner Burke has impressed the judges throughout the series. Her American smooth set the tone for the night, scoring four 10s, and judge Craig Revel Horwood joked that it was "absolutely dreadful because I couldn't find a single thing wrong with the routine". McGee scored a perfect 40 with her final performance of the night, an Argentine tango, and was praised by judge Bruno Tonioli for being an inspiration to an older generation. Atkinson earned her best score with 39 points for her American smooth but her thunder was almost stolen by Tonioli - who fell off his chair as the panel started their feedback. Who danced to what in the final? The previous contestants of this year's series also took to the dancefloor one last time for a group number. All in all, the dancing marathon lasted two and a half hours. Last year's final, which was won by Ore Oduba, only featured three finalists as singer Will Young had dropped out of the show earlier in the series, leaving them one couple short.